Traditional archery has always been a part of my heart. Memories as a toddler playing Cowboys and Indians with my older brothers still flow through my adventurous mind encouraging me to continue my path of traditional archery. As young children we would build forts out of sticks and pretend to be far away from our Hoosier woods into the mountains with Daniel Boone or Johnny Uma. These simple outdoor games instilled in me a love of the outdoors and hunting to last a lifetime. As life has continued my love for archery has grown. My husband, Ken, and I both shoot and love traditional archery. I find myself now encouraging youth and other women to enjoy the sport as often as I can via social media and any time I have opportunity. Continuing the stabilization or growth of the sport has become important to myself and many archers around the world. If we do not keep stability, at some point we may lose our hunting rights. This is why I consider the inquiry into the state of the current traditional archery market an important study for shooters and hunters. There are currently four demographics of traditional archery in America. First, we have everyone who shoots self-bow, atlatl, recurve and longbow. Some of these archers are bowyers, many are not. Some of them shoot wood only bows, some shoot fiberglass laminated bows. With great diversity they all share their passion for traditional archery. Their love of traditional archery has been handed down through their families and friends for decades. This demographic is said to make up less than 2% of all archers today in America. They are stable in number and have continued this way for a very long time. Their passion to make bows, arrows and other archery items is the highest of the four demographics and is bred into their souls. Second, we have those who began as compound archers and came over to traditional archery for various reasons. This group is also passionate about the sport. They are transitioning and many times don’t feel accepted in the traditional or compound groups. Some are trying to get back to their roots either honoring family members or remembering their childhood passion. Many watched the recent movies “The Hunger Games” or Disney’s “Brave” which sparked an interest. Some have listened to podcasts, which are currently popular, or have seen the lifestyle on social media where the romance or challenge has risen a desire inside them. Third we have beginners, either from 4-H Archery programs or other community or school clubs. Only a decade ago archery clubs were in very few schools. The main community archery practice was shot either in a local archery shop, a backyard or a local competition. These beginners are mostly in organizations such as National Archery in the School Program (NASP), Scholastic 3D Archery (S3DA) or 4-H Archery. NASP uses the Genesis bow which shoots with fingers but has wheels/cams. All students shoot these bows to make the competitions fair with similar poundage for each age group. In last year’s National competition NASP had over 14,000 youth shooters. These numbers are growing at a fast pace. Large scholarships are offered for shooters each year. S3DA allows the students to use whatever bow they like of their own. This allows for all students to learn about traditional archery as well as what students bring from home. Their organizations numbers are rising fast also. They also offer large scholarships for students. 4-H Archery have recurves and Genesis bows. Some clubs allow students to bring their equipment from home. When I taught 4-H Archery, every student tried the recurves as they may never have that opportunity anywhere else. I also took my English selfbow and other traditional bows in for them to see. This opportunity gave me a special relationship with many students that carries on today. One home schooled student went home after a seminar on flintknapping and made an atlatl. I saw first hand how encouraging it can be to share my love and passion of traditional archery with even a few students once in a while. Fourthly we have the groups such as Olympic/USA Archery/NFAA/ASA. These groups have been around for a long time. They use metal riser bows mostly, and concentrate on competition. USA Archery has coaches who teach instructors shooting methods and archery safety. Their Barebow competition is currently growing. The majority of this group do not hunt, according to the USA Archery coaches I spoke to, however, a passion for traditional archery does come from these groups and some do hunt. 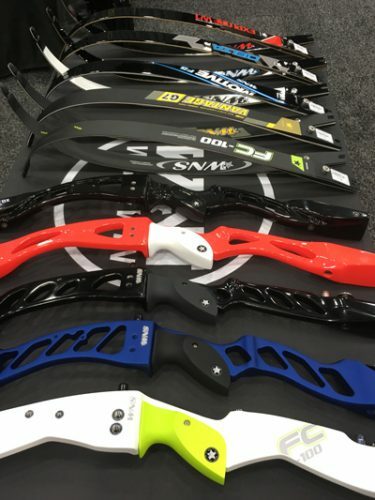 While at the Archery Trade Association (ATA) Show 2019 I had the opportunity to speak to diverse individuals and companies in the archery market to see what their thoughts are on the subject. This show gave great opportunity for my quest as it is the largest dealer/buyer archery and bowhunting show in the world. Companies new and old from all over the world attend each year to either sell or purchase archery and hunting related products. Overwhelmingly the compound and crossbow markets are more prevalent here. Each year different traditional only companies attend, from small archery shops across America to the large companies, and everything in between. Per the ATA Show website, this year there was 510,000 square feet of exhibit space, 9,172 attendees, 3,200 buyers and 620 exhibitors there. Large companies who sell traditional and other archery equipment, such as compounds and crossbows, had largely diverse opinions. Some said traditional archery is declining and archery in general is declining. 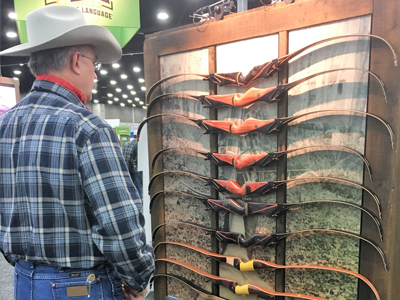 I found the companies who were knowledgeable of traditional bows, such as Bear Archery, Bearpaw, 3 River’s Archery, Stryker Bows, Ragim Outdoors and Lancaster Archery, felt the market has been continually stable for decades, and has experienced growth within their companies. If a company doesn’t have knowledgeable staff for the largest buyer/selling show of the year then their business in that area would be expected to decline. I am thankful for the companies who are striving to keep the traditional archery market stable. 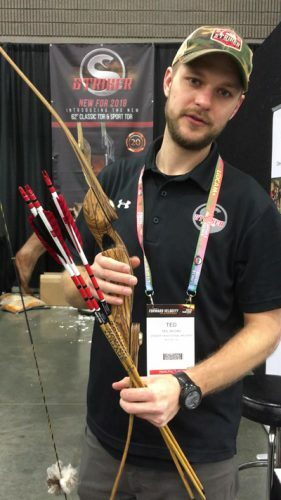 Henry Bodnik of Bearpaw Products gave a very good seminar this year at ATA titled, “Create Sales Go Traditional.” Henry shared his great passion for traditional archery and his business savvy to help small and large companies succeed with their traditional archery business. His attempt to help others is admirable and can only continue growth and stability of our sport. Henry stated traditional archery has been a stable market in America and Europe for over 70 years now. He believes the best thing to do is get children and women involved as the entire family will enjoy the sport and it will grow. Henry asserted for everyone to start archery ranges in our area, inside and outside, for family fun and practice for hunters. The following information I acquired through my interviews. Archers who have transitioned from compound bows to traditional bows, such as Aron Snyder of Kifaru International, Joe Allen, of HuntCo TV, Chris Parrish of Bear Archery, Beka Garris a social media guru, and Joella Bates who killed Africa’s Big Five with her compound, collectively felt the traditional market is growing as others move over from compounds to try traditional equipment. Jeff Danker of BuckVenture TV stated archery and hunting are declining all across America due to our culture. Jeff feels the need to teach our youth about archery through programs like NASP will start to stabilize the archery market again. 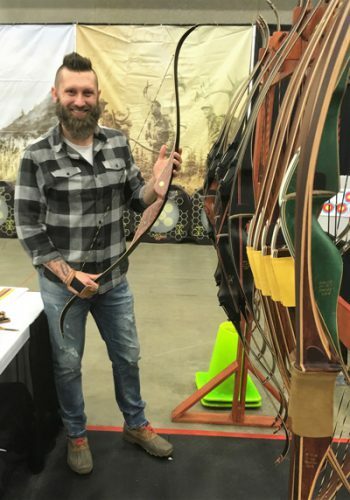 Archers who have always been traditional, such as Johnathan Karch of 3Rivers Archery, John Wert of Lancaster Archery, and Dusty Ellis of Stryker Bows, all agree the market is stable to growing. Johnathon spoke of the spike upwards in the market for a few years due to the movies “Hunger Games” and Disney’s “Brave”, however it is leveling off. John feels the internet information available and traditional archery forums help a lot, however the baby boomers getting older is a decline in the market. Dusty is seeing more people moving over to traditional bows trying to kill deer as a reason the market is growing. However, one main problem remains that many who want to try archery have no avenue to do so. We as archers dropped the ball by not offering more opportunities to this market. Yes, many organizations, such as Compton Traditional Bowhunters (CTB), and individuals have worked hard to tap into this group and to continually educate and offer programs to those who want to begin archery. Still many never had the opportunity due to not knowing where to begin. Many schools are still scared of any shooting sport. Organizations such as NASP, S3DA and CTB are slowly changing this. Getting these programs going will assist in keeping archery and hunting alive for decades to come. Judy and Ken with their grandchildren Wiley and Shakayla at the Cloverdale National 2018. CTB’s Rendezvous in June each year is a great example of how a group can share their passion and grow the sport at the same time. Each year they hold a day of fun activities for youth of all ages. Yes, it takes a lot of work, however it is very rewarding. They set up 3D targets and other games in an area central to the grounds between the camping area and shooting course areas. Throughout the day you can hear the crowd’s oohs and aahs and laughter. Way after dark this continues under lights as they shoot at flying targets. Their efforts are definitely assisting in keeping traditional archery stable and growing. In conclusion, if this article does nothing more than get us all talking about growing traditional archery in America, then I have successfully accomplished something positive. Giving instruction to inner city kids and students in consolidated schools who would otherwise possibly never have an opportunity to try archery is a good thing for our sport. I understand these are not all traditional archers, however, if we as traditional archers join in helping these organizations, we can share our passion. One step at a time, one child at a time we can at least give them the opportunity to try traditional archery and let them know it exists. If we don’t help, we are losing an opportunity. Walking into a room or meeting with a longbow or recurve immediately strikes interest. Traditional archery’s future is bright and it will continue to grow if we share our passion. If you choose to subscribe to my You Tube channel it is Judy Branham Films. 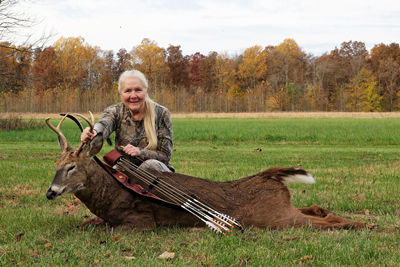 Judy killed her fall 2018 whitetail deer with a Bear Archery Grizzly recurve bow using Victory Archery Carbon Trad arrows and Muzzy broadheads. Author Bio Note: Judy Erwin Branham is an outdoor writer, wife and grandmother. She works as a substitute teacher and dispatcher for Police and Fire Departments. Judy is a World and National Champion traditional archer as well as a successful hunter. 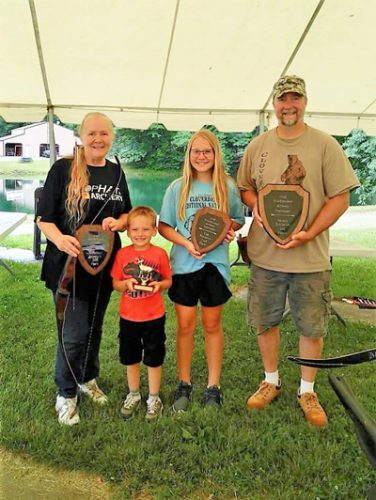 Judy Erwin Branham is an Outdoor Writer and Substitute Teacher living in Parke County, Indiana with her husband Ken Branham. Judy is an avid archer and hunter shooting a Bear Archery “Grizzly” Recurve bow and Victory Archery “3DHV” 600 arrows. Nice article, but you left out an even smaller subset, the people who shoot medieval or primitive design bows from foot or on horseback. Some of us shoot real horn and sinew bows, some of us the classic designs but made with modern materials. USA Archery has a Traditional division for traditional and modern longbows and horsebows for example. The SCA (Society for Creative Anachronism) has Open and Period (designs prior to 1600) divisions. Those in the SCA compete in garb from the Period. I was wondering where I could go to school fo bow building. Is there a school or would I have to go and find a person who has done it for years?